Nootropics, or smart drugs, are pills and powders that give you a mental edge. The goal of nootropics is to increase your mental agility and cognitive power. In an age of ever-increasing competition, nootropics are the latest frontier in staying ahead of the pack. Giurgea defined nootropics as something that has a positive effect (on learning and memory) and at the same time should produce no negative consequences, or even guard against them. The increase in the tonic control, control over nerve impulses, means that specific areas of the cortical (higher mental functions) or subcortical (sensory involvement) should be improved. And unlike many widely used psychoactive drugs, drugs that change brain functions and result in alterations in perception, mood, or consciousness (e.g. anti-depressants, pain medication, LSD, MDMA), nootropics should have little to no side-effects. Something that we will come back to later. In short, nootropics are smart drugs that enhance the brain and thereby give you a mental edge over others. And that is precisely the reason why more and more people are starting to use them. All our products will make your life more effective. Discover everything about Total Life Optimisation in our free ebook! This is our cornerstone article on nootropics. I recommend that you read what is relevant to you. Feel free to skip around and don’t hesitate to follow the links to read more about specific nootropics! Running low on time and forgot your speed reading app? Read the bold parts. Click on the links to go to another part of the article, or get specific information about a nootropic from examine.com. Want to get to know the science up close? Read the original papers when you click the annotations [3,4]. How Do You Use Nootropics? Nootropics are used to get a grip on your brain, to exert control where we could previously not. On the one hand, it is about your cognitive abilities, at the same time we want to influence emotions and our physical performance. Getting Things Done, The 4-Hour Workweek, The Checklist Manifesto and other books all describe how we can work smarter. They don’t describe how we ourselves can become smarter. That is the promise of nootropics when it comes to productivity. Nootropics can have a positive effect on long periods of concentrated cognitive effort. Writing a thesis, exploring a business opportunity or studying for an exam? Nootropics such as Piracetam, Adrafinil, and Phenylpiracetam are promising to help you with that. Piracetam can enhance brain energy, improve mental performance and memory. Corneliu E. Giurgea, the original nootropic inventor in 1968 . Nootropics can also help with short periods of intensive cognitive load under high pressure. Doing some last minute preparations, giving a public talk or facing a deadline? That is where nootropics can also provide a peak of sustained mental performance. Great examples of short-duration nootropics are Aniracetam and Noopept. They can provide you with the edge you need. They do this by allowing you to focus on the task at hand and forget distractions. A clear focus is not only helpful during work, it’s also a great boon whilst exercising. Imagine yourself standing in the gym, the weights are ready for you and all you are missing is some motivation. Nootropics can help you boost your willpower, give you some extra power, and a vital boost to your endurance. Nootropics are mainly used by people in good health. But many have been developed to help people with mental problems (e.g. dementia). Nootropics, therefore, provide neuroprotective and neurogenerative effects that can help you live an optimal life. Phenylpiracetam is lauded for its energising capacity. It may help enhance stamina and physical endurance. Noted should be that people sometimes compare the effects with that of amphetamine, and Phenylpiracetam is therefore also on the World Anti-Doping banned substance list. Noopept can be used as a pre-workout booster. The boost in willpower and resilience may help you perform better. And Citicoline (or CDP-Choline) could help you with neuroplasticity and neurogenesis and help your mental and physical health. L-Theanine has a calming effect and can help you feel in control. This nootropic is found in green tea and could be the perfect way for you to clear your mind. When you start with smart drugs you can have many questions. How many times do I need to take them? Can I use them all the time or do I need to cycle of them? How long do the effects last? Can I take multiple together? Where do I get my hands on some of these nootropics? The goal of nootropics is to give you a mental edge. It’s important that you know what to take and when. And this guide will help you make sense of all the information that is out there. Always remember that your brain is unique. You might react very quickly to Guarana but not feel the calming effect of L-Theanine at a low dose. And some days you may feel that nootropics have made you 200% more productive, and other days you might feel nothing. Keeping that in mind, here is our information about the use of nootropics. The most widely known nootropic is hiding in plain sight, it’s Caffeine. Drinking a cup of coffee 15 minutes before you go to sleep might not be the best idea. And the same principle applies for nootropics. You have to take nootropics when you need to. Some like CDP-Choline take 2-3 hours to start working and will be active for 6 hours . Others like Noopept might work almost immediately and last for a shorter duration [7 (rat study)]. If you’re making your own stack, always keep in mind that each nootropic has a unique way that it works. Most nootropics are designed for everyday use. Some of them you can take multiple times per day. But some, like Caffeine, are nootropics to which your body develops a tolerance. Tolerance is a person’s diminished response to a drug, which occurs when it’s used repeatedly and the body adapts to it. Alcohol is a well-known drug to which people build a tolerance . When you drink every day, you will start to feel a buzz only after a few drinks. Larger and larger doses must be taken to produce the same effect. Tolerance is developed in the body because the metabolism of the drug speeds up. Another reason for tolerance is that the number of sites that the drug attaches to (cell receptors) or the strength of the bond (affinity) decreases . With nootropics, this means that the efficacy of the smart drugs will be limited after a while. By cycling (see below), you can prevent most if not all tolerance-related problems. A higher dose is not always better. Take alcohol as an analogy. Having a few drinks may give you the desired effect of being able to socialise more, step onto the dancefloor and maybe even go home with someone. But after 20 drinks, you are most likely to fall off the dancefloor, talk to the bouncer and get shown the door. With nootropics, the same applies. There is a zone in which your focus is better but more of a substance will not immediately make you Bradley Cooper from Limitless. At a high dose, there is a higher likelihood of side-effects, and they may outweigh the benefits you were going for in the first place. Of course, a dose that is too low is also undesirable. You may feel nothing, or even feel the disappointment of not getting the desired effect. Small-scale experimentation is imperative to get the right dose for yourself. When you hear about cycling, was the first thing that came to your mind, riding a bicycle? Well, that is what most people think about, but actually, it’s something different. Cycling refers to taking a smart drug for a while, then cycling off it, and then taking it again. You cycle on and off. I guess it’s somewhat similar to cycling after all. Cycling can also refer to alternating, or ‘cycling’ through different nootropics for a period of time. This way you prevent the onset of tolerance or even dependency. At the same time, you get the benefit from each compound. I’ve found that after a month or so into any given stack I can sometimes get a little “stale” in terms of actually feeling the effects (even if I’m still benefiting) so just for fun I’ve taken my two favourite stacks and I’ve started rotating them one month on stack 1, then one month on stack 2. Just like riding a bike, cycling is about testing what works for you. Shuffle or arrange a deck of cards so as to gain an unfair advantage. Stacking is a great way to put some aces on top and win at the game of life. When you stack nootropics, you take a combination of two or more, to get the maximum effect out of it. Besides that, some nootropics are compounding. This means that they have different modes of actions (ways of activation) and together the effect is more than the sum of the parts. When you take other nootropics together, one can help to reduce the side effects of the other. The most well-known stack in nootropics is the combination of Guarana (caffeine) and L-Theanine. Caffeine is a stimulant, but also causes jitters and promotes anxiety. L-Theanine, on the other hand, reduces jitteriness but doesn’t negate the stimulating effect of caffeine. The final thing to keep in mind with smart drugs is to prevent dependency. Just like with many other things we eat (chocolate) and drink (coffee, alcohol), dependency can become a real problem. At the same time, million of people enjoy a cup of coffee every day without any negative side-effects. Nootropics will not make you dependent in a chemical way like other drugs (heroin, cocaine). But nootropics do have habit-forming properties and there is a chance of psychological dependencies. Think of it like running, someone who runs every day will feel uncomfortable if he or she can’t go outside for a run one day. One way to prevent a dependency on a particular nootropic is to reduce your intake over a period of days. As mentioned before with cycling, switching up nootropics can even make you feel the full effects again just like you did the first time. Now that you’re a nootropics expert, you want to start and try them out. Here are three examples of popular stacks. The first is the most common, the second is for the expert users with some more experience and the third is for the athletic person who wants to get into nootropics. This is the stack that we, at Queal, offer. It’s a stack that is easy enough to start with and at the same time provides you with scientifically proven benefits. Only the most widely researched ingredients have made this stack and we’ve done extensive testing to fine-tune the proportions. It will boost your mind and give you a calm focus! Visit our webshop to order your nootropics. We’ve made it easy to try the Flow stack. Check it out! Keep your brain as healthy as possible and reduce cognitive decline . Benefit from some cognitive enhancement and experience a better memory . Improve both acquisition and retention of information [28, 29]. This stack is one for people who want to get the most things done in the shortest amount of time. But be aware that Bacopa may make your stomach feel a bit upset, so this one is really only for experts. Enhance power output for athletes and reduce fatigue to be the best you during sports . Increase your endurance and resistance to cold . And improve your time to exhaustion . This combination of three nootropics will not only boost your brain, it will make your body do more. Do note that you may put on a little bit of (water) weight [33, 34]. To help you make an educated decision about which nootropic to take, here is our take on the most popular nootropics available. Guarana is one of the best-researched nootropics with a proven track record. Guarana helps you maintain focus and mental energy (alertness and wakefulness) . It contains a lot of caffeine and also has other components that may have additional positive cognitive effects. Learning and memory may be enhanced by Guarana [36, 37]. Guarana is also known as Paullinia cupana. It’s a fruit-bearing tree native to the Amazon Basin (South America). In Brazil, it’s also known as Brazilian cocoa. The seeds of the plant are ground into a powder. Traditionally it has been used for centuries, primarily for its stimulant properties. Many energy drinks of today also contain Guarana. The components of Guarana are Caffeine, Tannins, Catechin and epicatechin, Procyanidins B1-B4, A2 and C1, Polysaccharides rich in glucose and xylose, Dietary fibres including pectins and xylans, Carvacrol, Caryophyllene, Limonene, α-copaene, Estragole, Anethole, 4-(dimethyl propyl)-phenol. L-Theanine creates a sense of relaxation and calmness (think; sipping-a-cocktail-on-a-beach relaxed). This effect has a relaxing quality, which is not sedative (does not cause sleepiness). It has also been shown to reduce the perception of stress and slightly improve attention [38, 39]. L-Theanine is found almost exclusively in tea (mostly in the green variations). It’s an amino acid, one that is not commonly found in the average diet. The structure is similar to Glutamine (another amino acid) and the neurotransmitters that it Glutamine produces (Glutamate and GABA). It crosses the blood-brain barrier. CDP-Choline is another one of the tried and tested nootropics. CDP-Choline is neuroprotective (i.e. protects the brain) and potentially enhances learning [43, 44]. It stimulates the creation of membranes and dendrites. As a neuroprotective component, it may help alleviate (or prevent) symptoms of Alzheimer’s Disease . In nootropics, the benefits of CDP-Choline are recognised over using just Choline. In most cases, it’s used as a preventative and protective addition instead of an active compound. 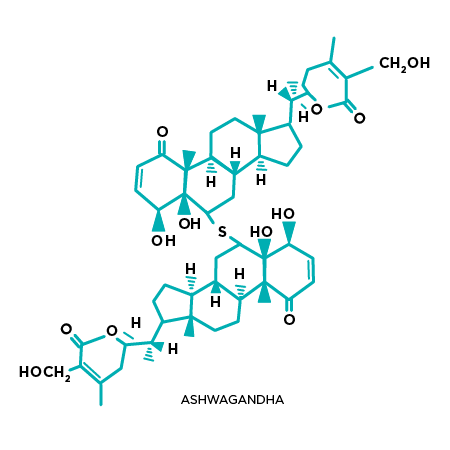 Ashwagandha is a herb from the nightshade family. It’s found mainly in India, Nepal, Yemen, and China. Other names for it are Indian Ginseng, Withania Somnifera, and Inverno Cherry. Ashwagandha is an adaptogen, which means it improves the health of your adrenal system by balancing it (promoting homeostasis). Clarity of the mind, by reducing stress, is what Ashwagandha does as a nootropic. In combination with CDP-Choline, it enhances the neuroprotective effects. In combination with L-Theanine, there is a double stress-reducing effect. N-phenylacetyl-L-prolylglycine ethyl ester (known by its brand name Noopept) provides a cognitive boost and has a small psychostimulatory effect. Noopept is a relatively new nootropic and can be seen as a more potent (up to 1000x) version of Piracetam . The effects in healthy humans are still being researched. Noopept is a synthetic molecule, which means that it’s made by humans and is not naturally present in nature. It may aid in memory consolidation and retrieval. Preliminary research even hints that it might help with long-term memory enhancement . In Alzheimer’s patients, it restores spatial memory and increases immunoreactivity to amyloid (protein fragments). There is currently no evidence that Noopept provides benefits for people with no cognitive ailments. Vitamin B12 is one of the unexpected suspects in the nootropics line-up. Vitamin B12 promotes healthy brain ageing and supports numerous essential processes of a healthy brain. Many people have a deficiency of Vitamin B12, up to 62% of 65-year-olds don’t have enough of it . Creatine is not only a nootropic, it’s also popular for performance enhancement. It’s a molecule that stores (and releases) energy. It’s good for strength and also can aid the brain, bones and liver. Creatine Monohydrate is the most common and best form to take. An increase in creatine intake (through food or supplementation) increases cellular energy stores, promoting the regeneration of ATP in the short term . Creatine reduces fatigue in cases of sleep deprivation . Creatine can be found in some foods like meat, egg, and fish (up to 5g per kg). There recommended dose for creatine (first 25g, then 5-10g per day) is much higher than available in these products, supplementation is therefore recommended. There is no need to cycle Creatine. Piracetam has been lauded as a strong cognitive booster. Current research suggests that it enhances cellular membrane fluidity. This effect is strongest for elderly people and could help improve cognition. Research on healthy adults doesn’t point to large positive effects at the moment. Piracetam is a nootropic in the racetam family. The most notable effect is the reduction in cognitive decline . Research points favourably towards the longevity aspects of Piracetam but doesn’t fully support claims about improved cognition. Some studies do point to weak cognitive enhancement in young adults . Although Piracetam, and the whole ‘racetam’ group of nootropics, is being promoted as one of the cornerstones of nootropics, the jury is still out on what the cognitive effects are. At the same time, there have been no studies that point to a negative effect when taking Piracetam. When you take Adrafinil (also known under the brand name Olmifon) you are stimulated, but not in a hyperactive way . You become more alert and wakeful . There may be positive effects on memory. Unlike other nootropics, the recommendation is to take it only up to 3 times per week. You are also recommended to not take for longer than 5 months. Adrafinil is a synthetic nootropic, that means it’s made in a lab. This doesn’t mean that it’s dangerous, but long-term effects on the liver are uncertain. Just like Phenylpiracetam (see below) it’s banned by the World Anti-Doping Agency (Olympics) . Aniracetam is part of the ‘racetam’ group of nootropics. Aniracetam one of the nootropics that may help with creativity and holistic thinking . It can also aid in reducing anxiety and improve social interactions . It may also help reduce depressive episodes . In your brain, Aniracetam increases the release of dopamine and serotonin. It also works on a mechanism that increases neural plasticity (learning capacity) in adults . Many studies are done on rats and more human studies are needed. Aniracetam has a bitter taste, therefore it may be best to take this nootropic in pill-form. Phenylpiracetam is part of the ‘racetam’ group of nootropics. It’s more neuroprotective than Piracetam and also possesses psychostimulatory effects. It is a chemically altered version of Piracetam. It is made by adding a phenyl molecule group to the Piracetam compound. The recommended dose is 100-200mg (3x per day). Studies about Phenylpiracetam have only been done with people with cognitive impairments and the jury is still out if it has any effect on young and healthy people . Besides the possible nootropic effects, Phenylpiracetam is also known for an energising effect. A thing to note is that Phenylpiracetam is banned by the World Anti-Doping Agency (Olympics) due to the reported psychostimulatory and cold resistance properties [66, 67]. Melatonin is a hormone that regulates sleep. Your body secretes it in the pineal gland. If you are exposed to screen in the evening or are just in a very light environment, your own production of Melatonin may be suppressed. If you work in shifts or have trouble falling asleep (insomnia), Melatonin will very likely help you [68, 69]. It also has neuroprotective effects, it’s a powerful antioxidant. The main effect from Melatonin is that it helps you fall asleep faster. Melatonin can promote a healthy sleeping pattern and thereby promote a better lifestyle. As a nootropic, it is mostly used to fall asleep faster . Bacopa Monnieri (or just Bacopa) is a reliable and effective nootropic to improve memory. It improves memory acquisition and retention in healthy people [71, 72]. Another study showed improvements in mental control, logical memory, and paired associated learning . Bacopa is not the tastiest of nootropics. It will also upset your stomach if you don’t take it with a meal (so take it with a meal). The recommended dose is 300mg (55% active). Because of the bad taste, it’s recommended to take in capsules. It is also one of the few nootropics that take a long time to start working. The effects are much more pronounced at 8-12 weeks than at 4-6 weeks . Alpha-GPC (or Alpha-glycerophosphocholine) appears to have cognitive-enhancing properties. This has only been studied in rodents and elderly people for now. Alpha-GPC has the ability to enhance growth hormone production and enhance power output. Alpha-GPC is about 40% choline, and it works in a similar way to CDP-Choline . For sports purposes the recommended dose is 600mg, against cognitive decline 1200mg is recommended. Alpha-GPC is found in some red meats, but the amounts are negligible. Power output may increase up to 14% when you take Alpha-GCP (pilot study, ). There is a small effect on fat oxidation and growth hormone production is activated [77, 78]. If you want to start with nootropics, we offer you a great combination of the best-researched components. You will not only get the increased alertness from Guarana (caffeine), a calm focus is achieved through L-Theanine. If there is a perfect way to start with nootropics, I believe that this is it. Want to know something very specific or do you have a strong opinion about a nootropic? Let us know on the forum or send an email to [email protected]. Thank you for being part of the future!